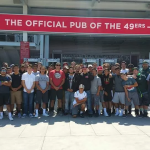 Members of the Capuchino football team attended the 49ers Monday night football game vs. the LA Rams on 9/12/16 to hang 49ers Faithful and 49ers flag banners. The team did a great job and represented Capuchino. Thank you to the 49ers organization for the fantastic experience and great job Mustangs!! !